Glad you liked the recipe - they really are colorful! Do you remember my Inside Out party I threw a few months ago? 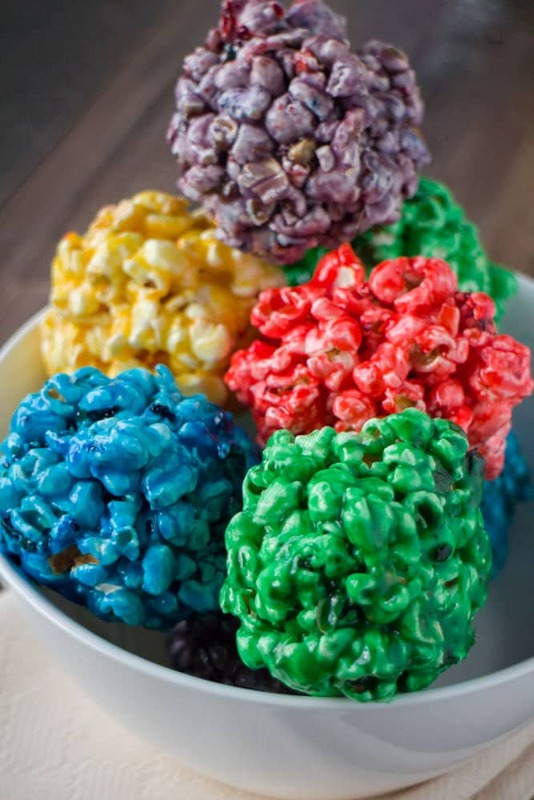 One of my food centerpieces were these Rainbow Popcorn Balls! There’s something about bright rainbow colors that makes me happy! For example I had to turn our pumpkins into a rainbow earlier this week. It’s like sprinkles, everything is better with rainbow sprinkles! Or how about my Birthday Sprinkle Muffins? They’re cute and delicious! 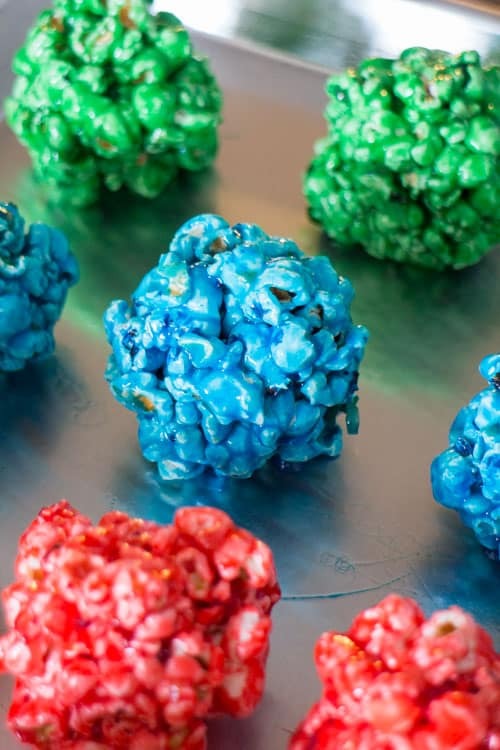 One taste of these Rainbow Popcorn Balls will have you amazed by how delicious they are, but yet how easy they are to make! If you are wondering 20 cups of popped popcorn equals about 3/4 cup kernels. I used my air popper which is one of the best kitchen purchases I’ve made! If you are using microwave popcorn this is about 3 bags. Once the popcorn is made separate it into bowls. If you are doing 5 rainbow colors use 5 bowls. 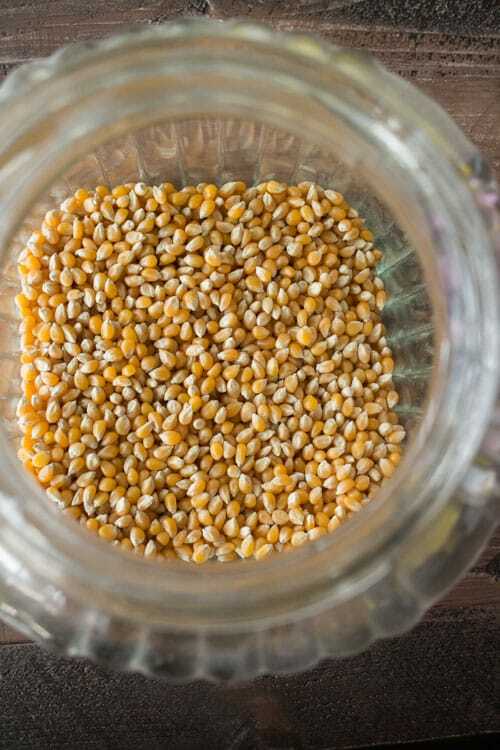 Make your corn syrup mixture per recipe directions. 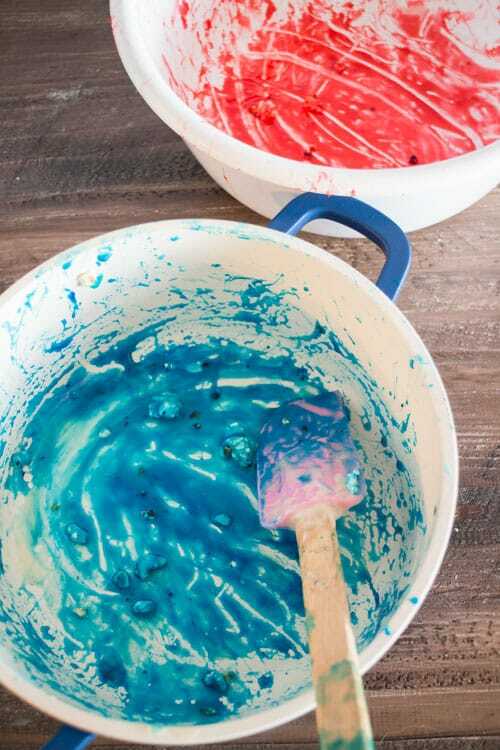 Have your food coloring nearby each bowl. 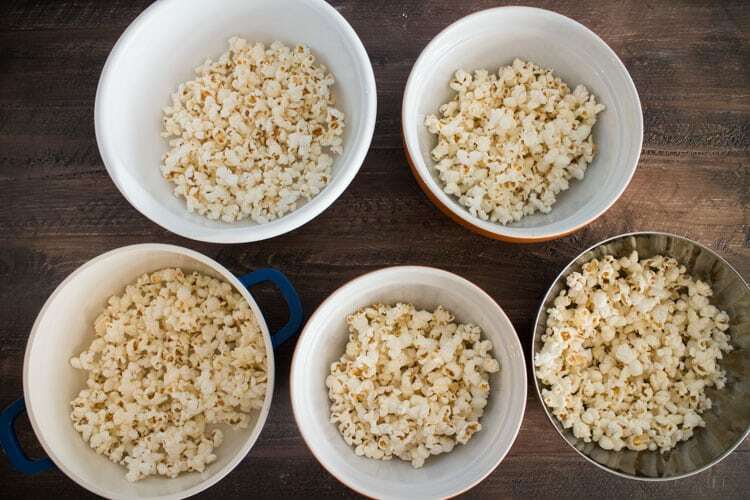 Divide up the corn syrup mixture into how many bowls of popcorn you have. Add 2 drops of food coloring into the bowl. 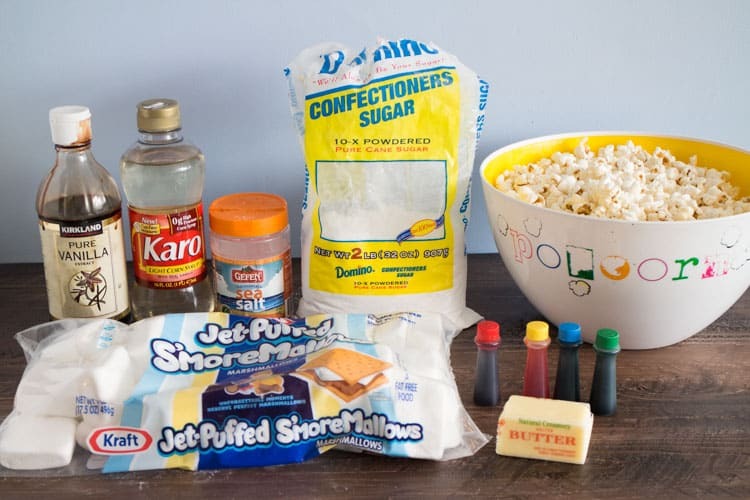 Now mix with a spoon or spatula until all the popcorn is covered. I was too sticky to take a during picture but this is the after picture. To make things less messy use food safe gloves sprayed with nonstick spray when forming the balls. Make sure to use a different pair of gloves for each color so you aren’t mixing colors. 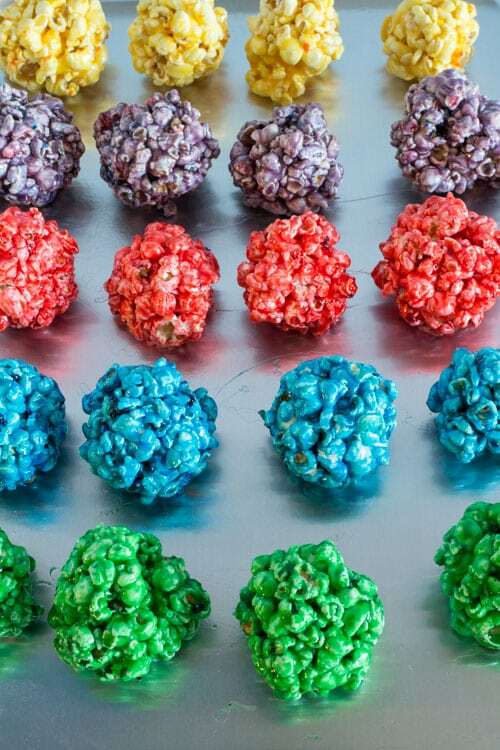 And just like that you have beautiful rainbow popcorn balls to enjoy! You could put these on a plate or wrap each one individually with plastic wrap. I made these for a party and they were the first snack gone! High 5! For parties I love placing them in individual mason jars. This really adds a nice pop of color to a table! 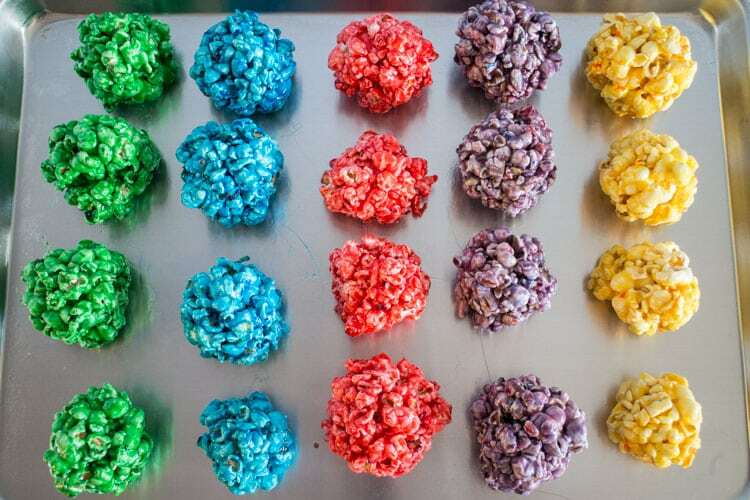 Enjoy these rainbow popcorn balls! 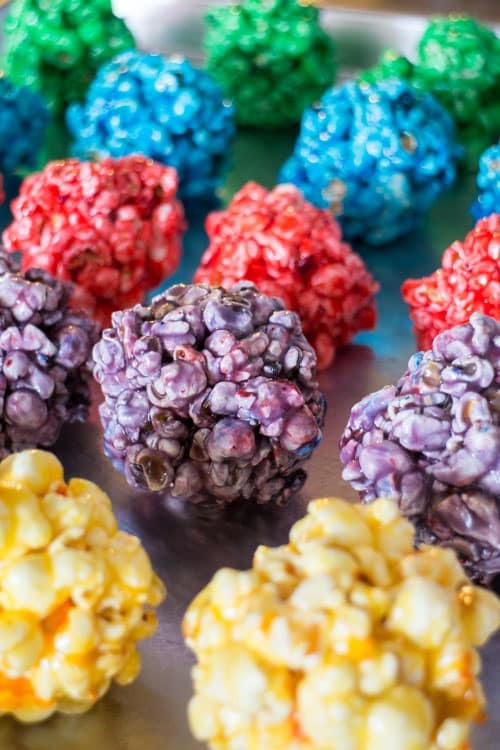 How to Make RAINBOW Popcorn Balls with marshmallow! 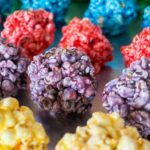 This easy DIY recipe walks you through how to make popcorn balls that are colored using food dye and karo syrup! They're a great snack and dessert for birthday parties! 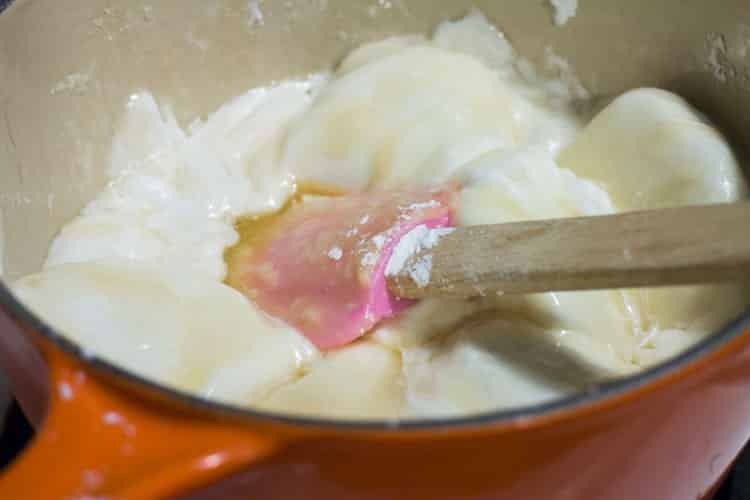 In a small pot over medium high heat combine corn syrup, butter, sugar, marshmallows, water, vanilla and salt. Keep stirring until mixture comes to a boil. Separate popcorn into bowls depending on how many different colors you are using. 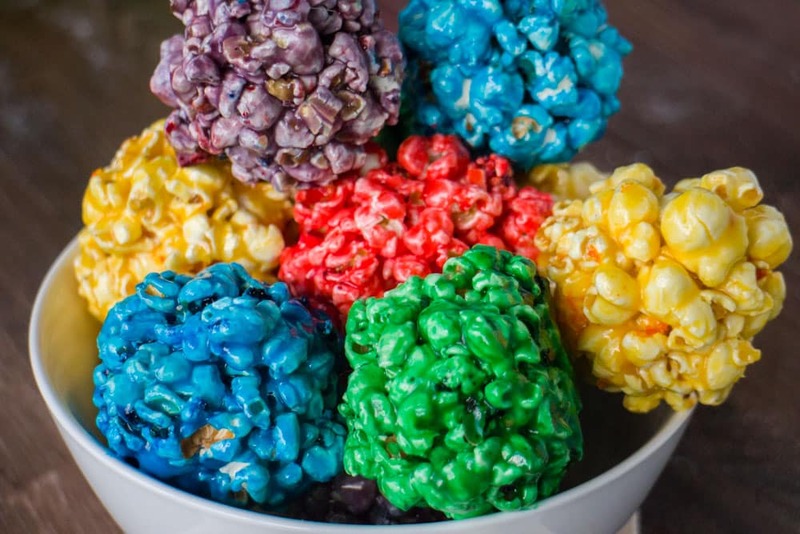 If you are using 5 colors, separate popcorn into 5 bowls - this will make it safer so you don't mix colors. Carefully (it's hot) pour your syrup mixture into bowl of popcorn. Make sure to equally distribute into each bowl of popcorn. For example if you are using 5 colors, separate the syrup into 5 equal parts. Add 2 drops of food coloring to the bowl. 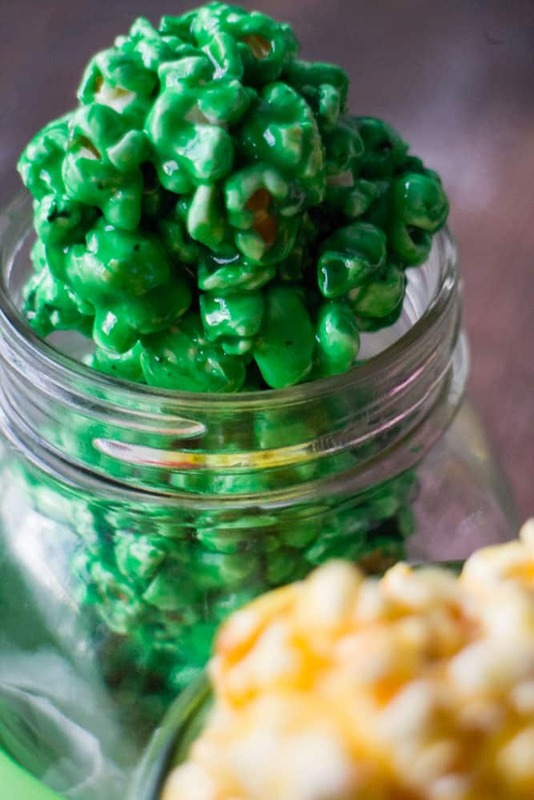 With a spoon stir popcorn so every piece is coated with syrup mixture. Tip: Use a different spoon for each bowl so you don't mix colors. Using your hands shape into popcorn balls (whatever size you prefer). You have to do this quickly before the syrup cools off. 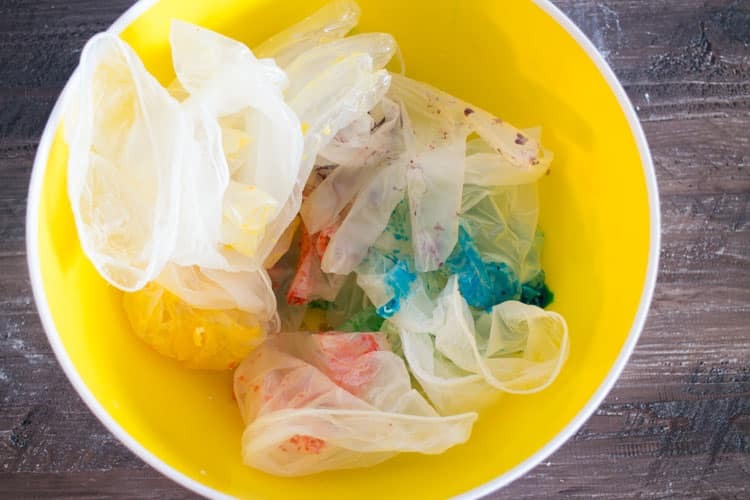 You can use food safe plastic gloves sprayed with nonstick spray to make this easier to do. Makes about 30 popcorn balls. This is a whole lotta fun, Pamela. I know my son and his friends would love these. Who doesn’t love popcorn and rainbow colors. : ) Have a great weekend! Aw so fun, you make it look so pretty! 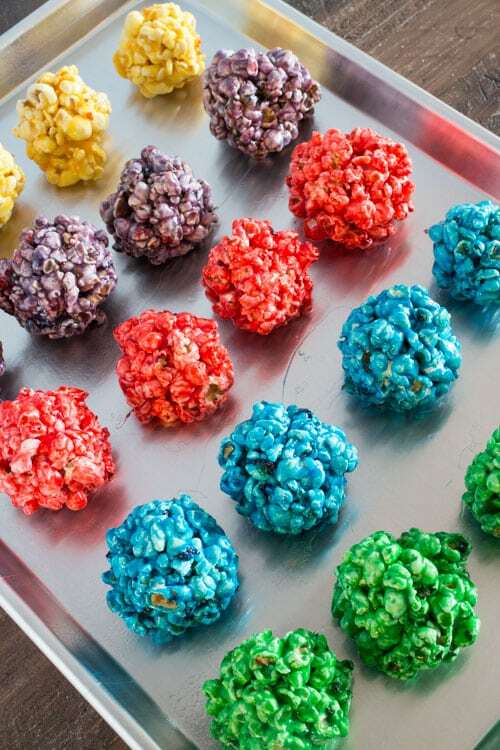 These popcorn rainbow balls look super cute and intriguing. And what a lovely idea to wear gloves. Love how fun they are. Hope you are having a wonderful weekend. Oh my gosh they are so gorgeously colourful!! I need to try popcorn like this :). So nostalgic! 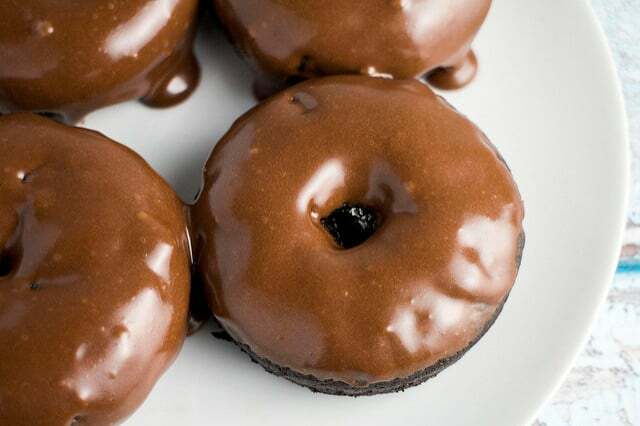 What I would give for one of my grandmother’s homemade treats like this! Aww thanks Debra, that’s so nice! Omg this looks so delicious, I can’t wait to try it out on my Halloween party! Oh my goodness these look so fun and I love that you arranged them like the characters in Inside Out! Those are so pretty! And the gloves are a great tip — I’m always getting turmeric etc. on my fingers. Hey! it looks colorful, I think we must enjoy days with snack like this, thanks for sharing your colorful idea! If you keep them in the refrigerator, I’d say a week. To be honest though we usually eat them all in the same day! They are super cute Ginnette! Kids love them! Have fun! Hi I made there they taste so good .but they would get hard and they aren’t crunchy .what am I doing wrong .I followed all direction .how do I measure the marshmallow. Probably over-heating syrup or boiling too long. Heat to 270° on a candy thermometer. Or until a small amount of syrup dropped into very cold water separates into threads, which are hard but not brittle. Remove from heat. I made these for my sons birthday party and everyone loved them. I used different shades of blue food dye! Thank you! My colors didn’t come out vibrant and fully coating. What am i doing wrong? 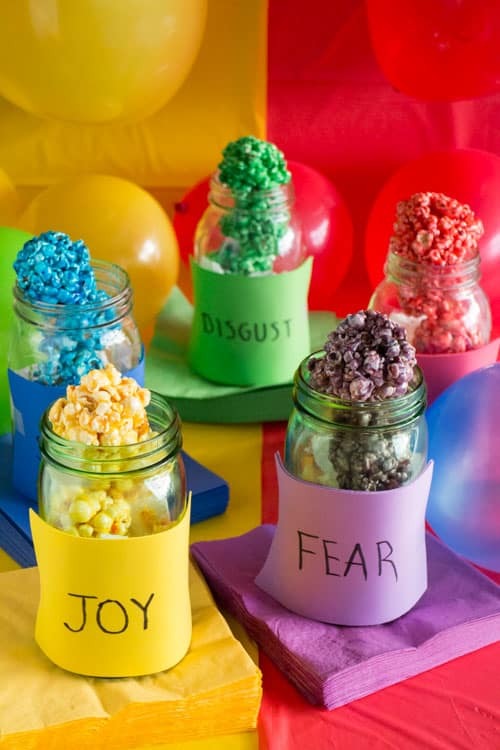 2 drops of food coloring might leave the slightest haze of color but to get the colors shown in the photos you would need to mix close to a full container of color! Hey Joe – I promise you I only used 2 drops! Food coloring is pretty intense with just the slightest drop. Enjoy the popcorn balls! Awesome..thanks for the recipie..i juz love to taste it…exclusively colorful..
Glad you liked the recipe – they really are colorful!